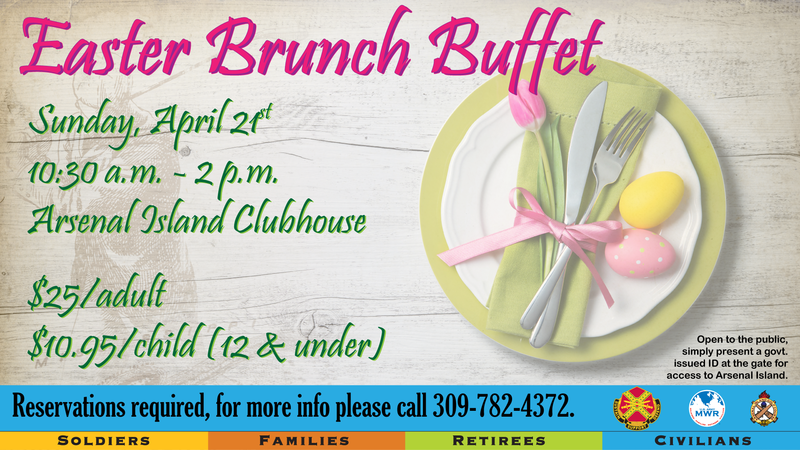 Date: Apr 21 2019, 10:30 a.m. - 2 p.m.
Come celebrate Easter at the beautiful and historic Arsenal Island Clubhouse. This all you can eat buffet will feature holiday favorites like smoked salmon, pork loin wellington and baked ham with brown sugar mustard glaze. Cost is $25/adult and $10.95/child (12 & under). This event is open to the public and you will simply need to present a valid gov. ID at the gate to access Arsenal Island. Reservations required by calling +1(309) 782-4372.